How can decommissioning be easier to manage - including making it easier for more companies to get involved, and take on more of the responsibility? We'll explore this subject at our decommissoining forum in London on June 23. At the Decom Offshore event in Aberdeen on May 24, Roger Esson, chief executive of Decom North Sea, began by saying that the subject might now be considered "late life asset management" or mature basin management," with many more skills and technologies coming into play. Previously, the decommissioning business was previously (arguably) just about a relationship between operators and their contractors. Now we are seeing alliances form to offer a complete late life asset management service. Also, we are seeing innovations in insurance and financial management, and people exploring re-use of equipment both topsides and subsea. More attention is being given to political, financial, regulatory and joint venture aspects, and much more strategic thinking overall is happening about different ways to move forward. There is also much thinking about what can be learned from the nuclear sector. If you have subsurface expertise, there could be business opportunities too. Managing downhole risks is, of course, a very high priority and concern, and you may be able to assist. You could also provide advice about future production potential of an older asset. It isn't just a UKCS opportunity - the Dutch are getting heavily involved. We heard at the conference that 75 per cent of the Netherlands' gas platforms will be uneconomic within 3-4 years at the current gas price. The Netherlands has 156 platforms and 700 wells, compared to 323 platforms and 4,000 wells in the UKCS. You can find out more about the opportunities and join the discussion at our conference on June 23rd. As on previous years, the conference will be chaired by Greg Coleman of Petromall, a former global head of HSEQ with BP (and current CEO of Independent Resources Group and Echo Energy), and Graham Scotton of Petromall, formerly COO of Dana Petroleum. We have speakers confirmed from ABB (on what we can learn from onshore decommissioning), Zolnai on managing the information supply chain, KM Dastur on approaches to insurance, and Christopher Lloyd of Petromall on new management approaches. 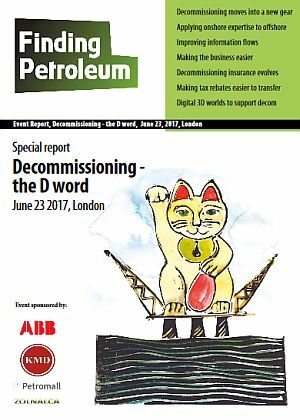 See Petromall Insights June 2017 report - "Making Decommissioning Easier to Manage"
KM Dastur Group is a leading independent insurance broker and risk advisor, with 27 offices in Asia, Africa, the Middle East and Europe. It handles around $1bln premiums worldwide, and employs over 1000 insurance professionals and risk advisors. It focusses on energy, aviation, re-insurance and speciality business lines, including kidnap and terrorism. The Energy Division within KMD London has vast experience in all energy aspects, including upstream (operational, drilling contractors, construction, decommissioning), downstream, power, mining and renewables (hydro, wind, solar, bio fuel, wave/tidal, geothermal).